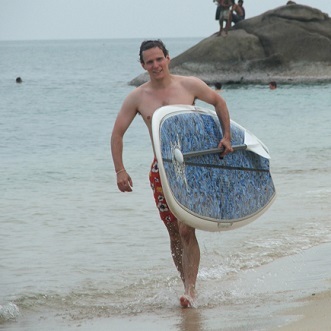 you can discover the samui coasts with our paddleboard at your will..
During your holidays you can rent a sup paddle board and keep it a your resort or hotel. so you can en joy and practice a your convenience... .
1 hour of initiation ...plus half hour free time..
Are you surprised by the popularity in stand up paddle boards (SUP)? A little big of history is that these boards were used by a lot by surf instructors in the 40’s and 50’s to take pictures of their students on them. when the popularity of the stand up paddle board blew up. You can even see pro surfers like Laird Hamilton still using the SUP just for fun. to use one. You can use them in lakes and rivers just as well as in the ocean. They are still great surfing training tools as well. The novice can continue to enjoy the water along with their surfing buddies. One size does not fit all with a paddle board. Just like when picking out a surfboard it comes down to your exprience level. 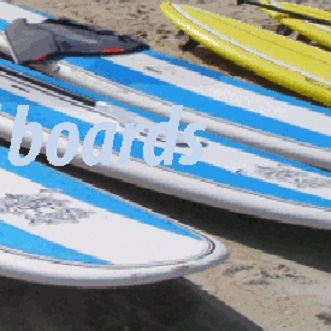 Wider boards suit the beginner while thinner boards may work well for the experienced surfer. The same holds true for the length of the board. A shorter length can provide more stability while a longer length is better for paddling and gliding. 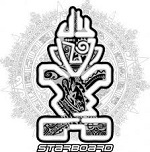 Overall,for beginners and training purposes, stick to a wider board with a good length to provide stability. Most of all, have fun with stand up paddle boards. Their popularity won’t be fading any time soon! 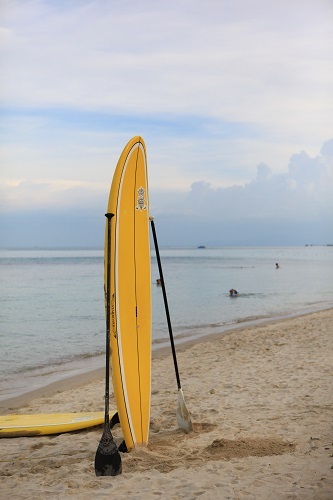 with us You can rent a paddleboard and keep at your own place, we organise the delivery..